← Bideford Chamber of Commerce. In January 1992 the Chinese container ship ‘Ever Laurel’ was carrying 1,810 containers from Hong Kong to Tacoma in America’s Washington State. All was well until the tenth of the month when, during a great storm, twelve of the 40-foot containers were washed overboard. One of these held 28,000 plastic bath toys – red beavers, green frogs, blue turtles and yellow ducks, each in a plastic and cardboard housing. How the container opened is a mystery, but certainly the cardboard quickly deteriorated and allowed the toys to float. There are two great contra-rotating currents in the Pacific, and the southerly one carried these ‘friendly floatees’, as they have been called, as far as New Guinea, Australia and the remotest tip of South America. However, our interest is in what happened to the floatees caught up by the northerly Sub-Polar Gyre in the Bering Sea. Coincidentally, ten months after going overboard, ten toys were picked up near Sitka, Alaska. It was then calculated that the Gyre would carry some through the Bering Gap into the Arctic, where they would be frozen in the Polar ice. After six years the ice, drifting eastwards along Canadian coast, would carry any floatees into the Atlantic. 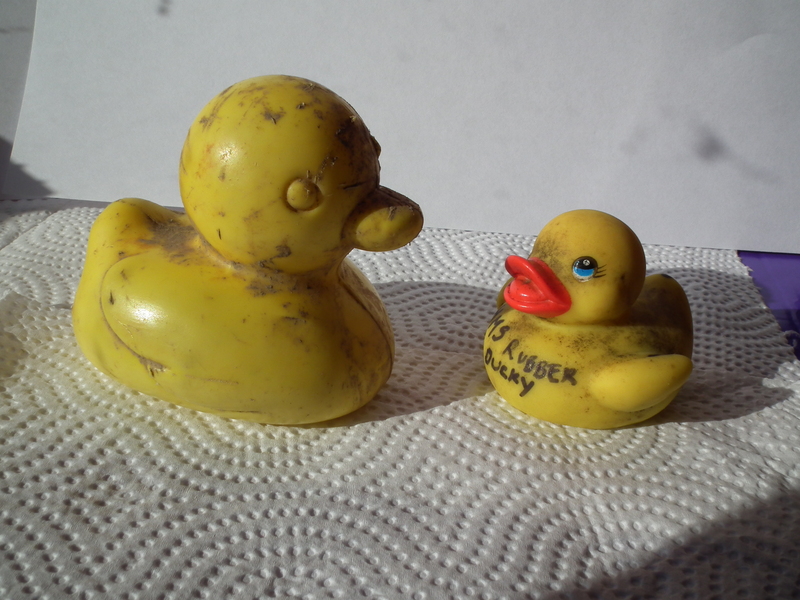 Incredibly, in 2001, some duck floatees were tracked in the area where the Titanic sank in 1912. A great deal of scientific interest has centred on these tiny toys, whilst helping oceanographers study sea currents. A book written by journalist Donovan Hohn, entitled ‘Moby-Duck’, tells of beachcombers’, oceanographers’, environmentalists’, and the author’s own search for them. An American oceanographer, Curtis Ebbesmeyer, is particularly interested. Ducks and beavers have been bleached white, but the turtles and frogs have kept their colour.